SHOTSMAG CONFIDENTIAL: Yorkshire Gets Sherlocked! Sherlock fever has gripped Yorkshire as a charity’s campaign to set a new Guinness World Records™ title for the Most People Dressed as Sherlock Holmes has gone viral. Sherlock Holmes, one of the most popular consulting detectives of all time, is on the case to help raise money for the Yorkshire Brain Research Centre at the Leeds Teaching Hospitals. The Guinness World Records attempt promises to be the biggest Sherlock party ever. It takes place on 31st August 2014 in Temple Newsam, Leeds from 12 noon. The entry fee is £15 and every participant will receive a Deerstalker hat, pipe and magnifying glass on the day of the event. The minimum number of people required to set a new Guinness World Records title is 250 participants. The world's biggest Sherlock party will include a big stage featuring comedy, music, dance, cosplay, circus and theatre. There will be food, fun rides and a few special guest surprises along the way. The event has galvanised world-wide support with donations from Chile, France, USA, Canada, Japan and Mexico. Sherlocks have been popping up all over Yorkshire and from around the world on social media, with Sherlock fans posting #sherlockselfie pics to help raise awareness of brain research and the world record attempt. Pictures have been posted from the Great Wall of China, from Australian beaches, and outside 221B Baker Street itself. #sherlockselfie pic will win return British Airways flights to London, a night at the five star Royal Horseguards in a river view executive room with breakfast and a visit to the Sherlock Holmes Museum at 221B Baker Street. Social media fans are being asked to TEXT BRAIN to 88811 to donate £5 and to nominate a friend. 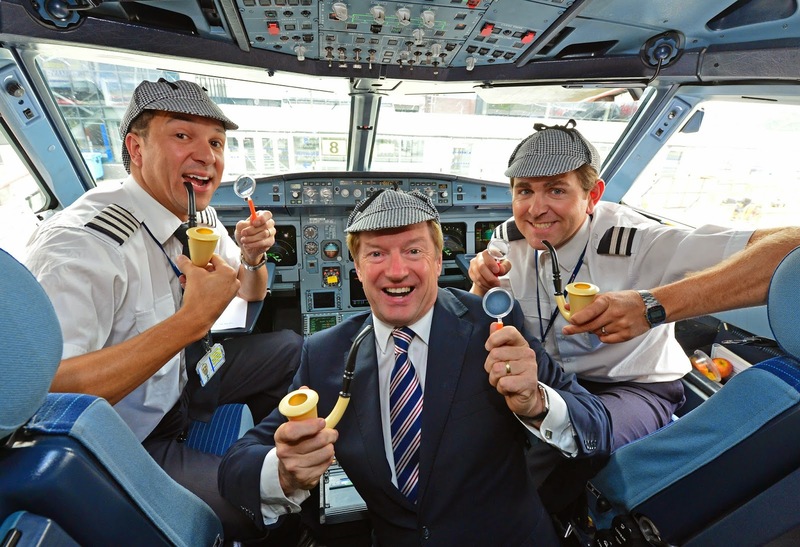 Celebrities, businesses, and sporting stars have also joined the case for Sherlock, with cast members of Emmerdale, players from the Huddersfield Giants Ruby League, and a British Airways Sherlock selfie of pilots and air staff taken in the cabin of a jet at Leeds Bradford Airport. To register to the event go to www.sherlockworldrecord.com. Pictures - Outside on the runway: Launching their own world record “selfie” are: (left-right): Tony Hallwood, Leeds Bradford Airport aviation development and marketing director, Lucy Jayne Pattinson, British Airways’ customer service agent and Jim Keegan, British Airways’ regional customer service manager UK regions & Ireland. 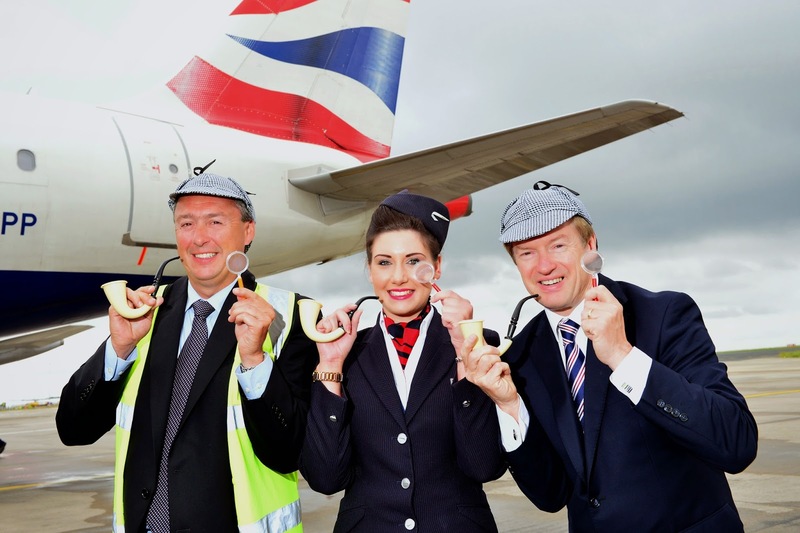 In the cockpit: Captain Spencer Tavares and first officer Richard O’Brien launch the Sherlock ”selfie” world record attempt with Tony Hallwood, Leeds Bradford Airport aviation development and marketing director on the flight deck of the Leeds Bradford-London aircraft. Scott Grix and Chris Baily from the Huddersfield Giants looking for clues. Neil Grainger is an Actor and Comedian, starring in such programmes as Eastenders, Judge John Deed, Crossroads and most recently BBC2 sitcom Hebburn in which he played deluded pub singer Gervaise alongside Vic Reeves and Gina Mckee. Born and bred in North Yorkshire, Neil is a proud northerner and thrilled to be presenting the Sherlock World Record attempt for such a great cause. Re-Wired- Re-wired is an Indie Rock band from Scotland. Their energetic and passionate live performances really make them stand out from the crowd and put on an unforgettable show to their fans. The honesty in their lyrics tied in with punchy guitar riffs complement front man Andrew Nagle’s voice perfectly and are sure to have you on your feet at any gig in which you see them at. Tom Donaldson Badger-Tom is a young but extremely talented singer and entertainer. He draws his influences from classical and swing music and has a huge passion for musical theatre. Tom loves to be on stage and the confidence he exhumes whilst performing means there is an instant connection between him and his audience. Area 40 Five experienced musicians performing original yet contemporary songs. An eclectic mix of style and content from the several singer songwriters within the band. Songs that indulge vocal harmony with dueling electric violin and lead guitar solos. A melting pot of varied influences and sheer enjoyment of music. Debut CD ‘One Small Step’ released in 2013 and recent Tour De France single ‘Road Trip’ available via www.area40.co.uk and itunes. The band name refers to an area of the brain – Brodmann area40 – an area associated with language and music. Attendees at the Sherlock World Record are in for a real treat when The Flanagan Collective and Harts horn – Hook Productions in association with York Theatre Royal, performs a taster preview of their new production of Sherlock Holmes ‘A Working Hypothesis’ on the big stage.